弄堂 (lòng táng) Alley – In the past where many households live in the same block of flat with no luxury of space, residents often use the alley as an activity area to sun their laundry, park their bicycles, engage in various forms of recreational games or simple food trades. However, the term is particularly used in Shanghai. In Beijing, alleys are called 胡同 (hú tóng) whereas, in Chengdu and many other parts of China, they are referred to as 巷子 (xiàng zi). In the ancient past, the distinction made between cousins was strictly meant to forbid marriages between offsprings of brothers. In Chinese culture, females are "married off" to another household (adopting a different surname) hence, in terms of bloodline, offsprings of Father's sisters are not as close as those of Father's brothers. Back then, men could have many wives and children. As a result, families tend to be pretty extensive. 表-Cousins seldom get to see each other, especially the female ones who were mostly kept at home. 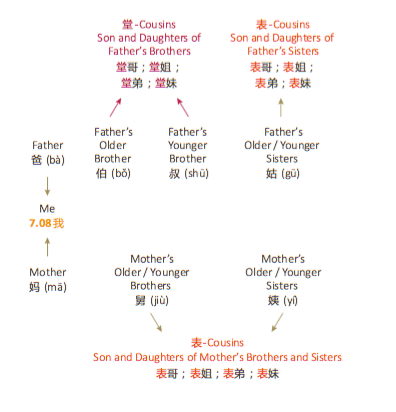 When children were of a suitable age, marriages are sometimes arranged between 表-Cousins. Today, marriages between cousins are fairly uncommon but the distinctive way of addressing various family members remain.